Ok, for some strange reason, I found myself feeling somewhat nostalgic over the weekend. Maybe it was all the snow we had on Saturday night which reminded me of the great blizzard of ’78. Who knows? 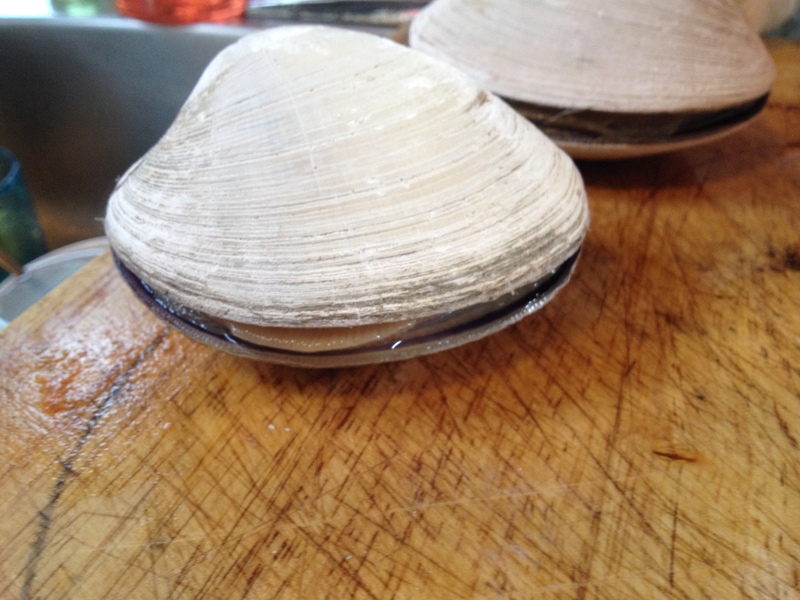 On Sunday, I found myself at my favorite fish market in Westerly to pick up some shrimp for the jambalya I was making that evening and saw, much to my amazement, some huge quahogs. They looked just like the ones that my parents used to dig up from Narragansett Bay when I was a child. I suddenly got a hankerin’ for stuffies. 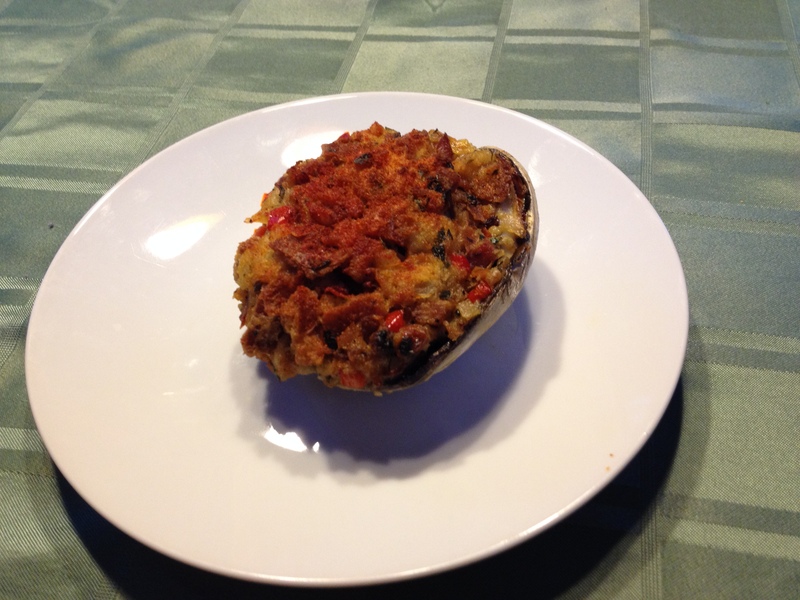 To the uninitiated, a “stuffie” is a stuffed clam in these parts. My mom had a really good recipe for them, which I unfortunately never got from her, so I was on my own to try to figure out a new version. I’ve had them several different ways, from the really dry and rubbery to the positively delicious, but none of ever held a candle to my mom’s. Although what I dreamed up, I must say, came out really good so she must have been on my shoulder guiding my every step. Both Eric and our friend, Ed, liked them. Saute veggies and sausage in olive oil with cracked black pepper and salt ( don’t use too much if your clams are salty, taste the brine first and you will know) until soft. 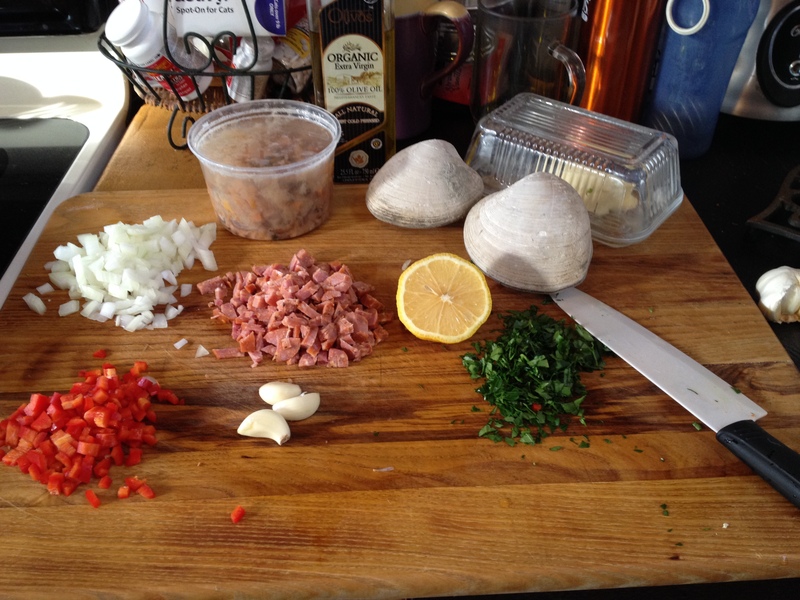 Next add chopped clams, wine, lemon and butter to pan. Keep on low heat until the butter melts. Take off the heat. 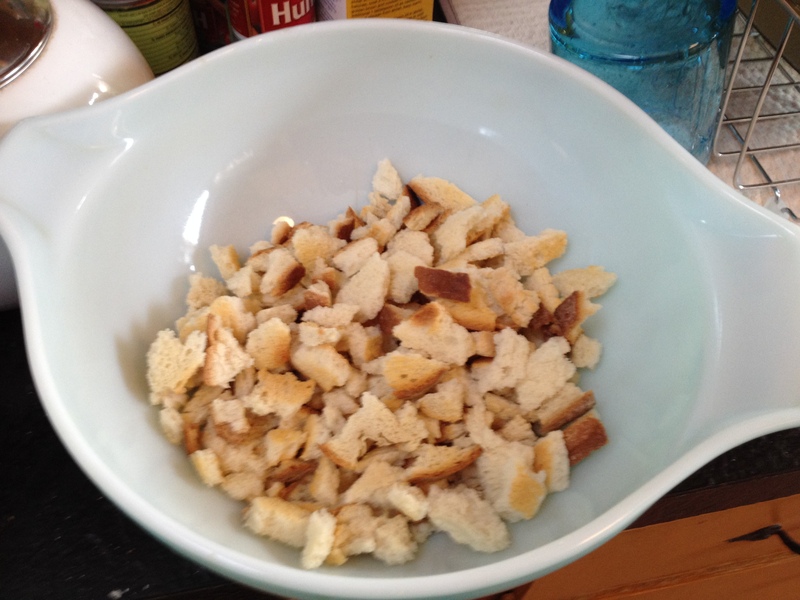 Toast bread, crumble into semi small pieces. 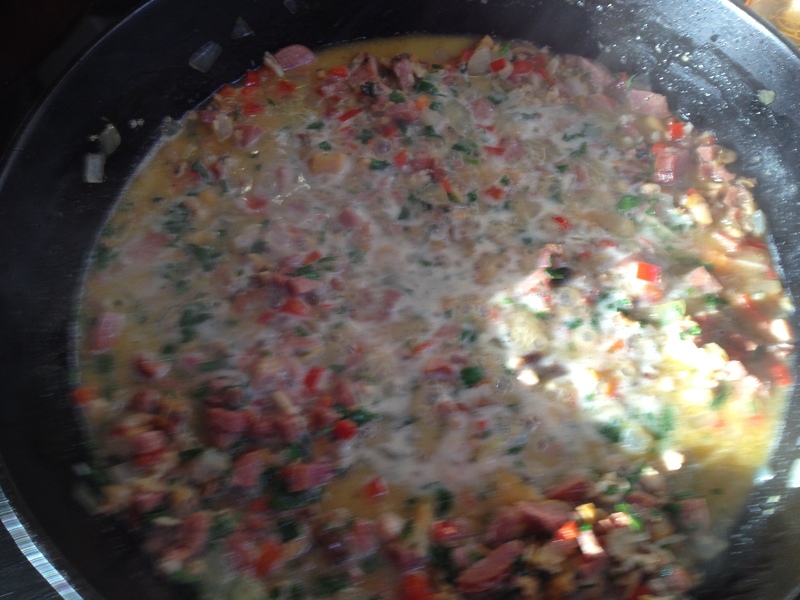 Add to cooled mixture and toss until liquid is absorbed. 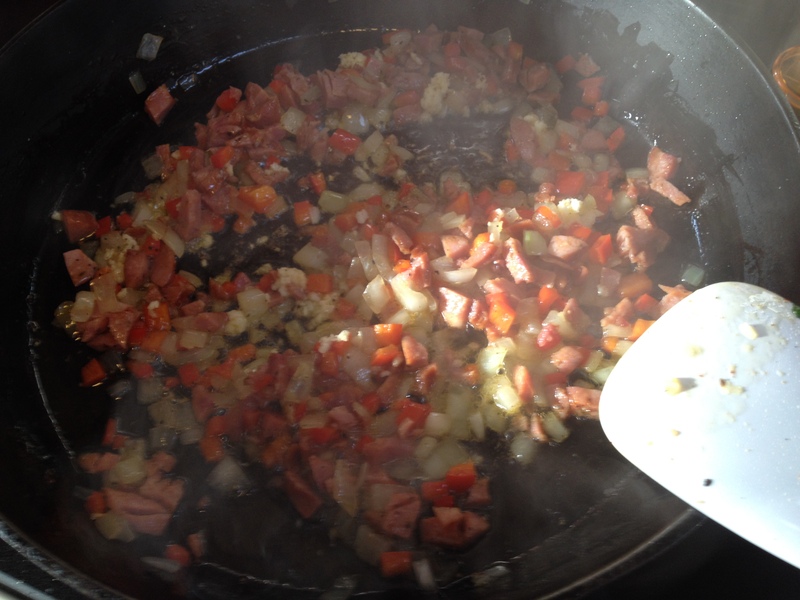 Add some olive oil until it is sufficiently moist. 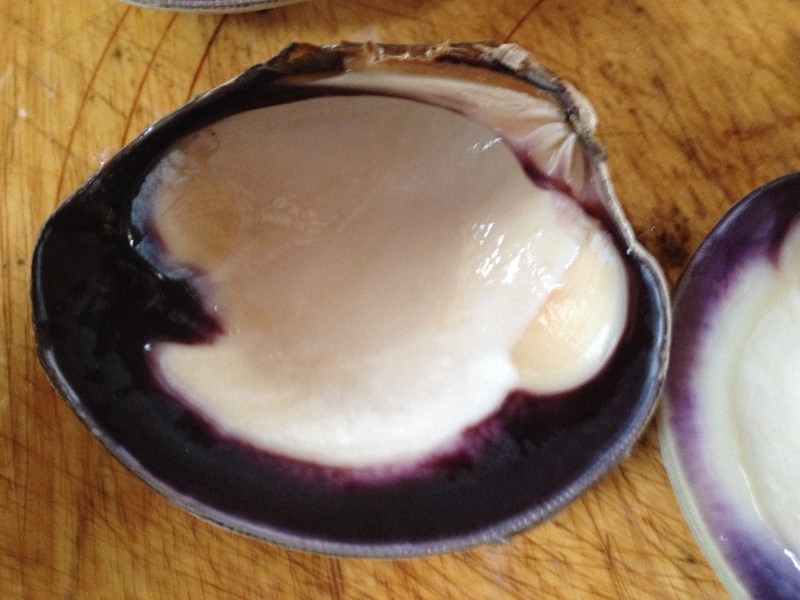 Or you can add some of the clam juice if it is not too salty. 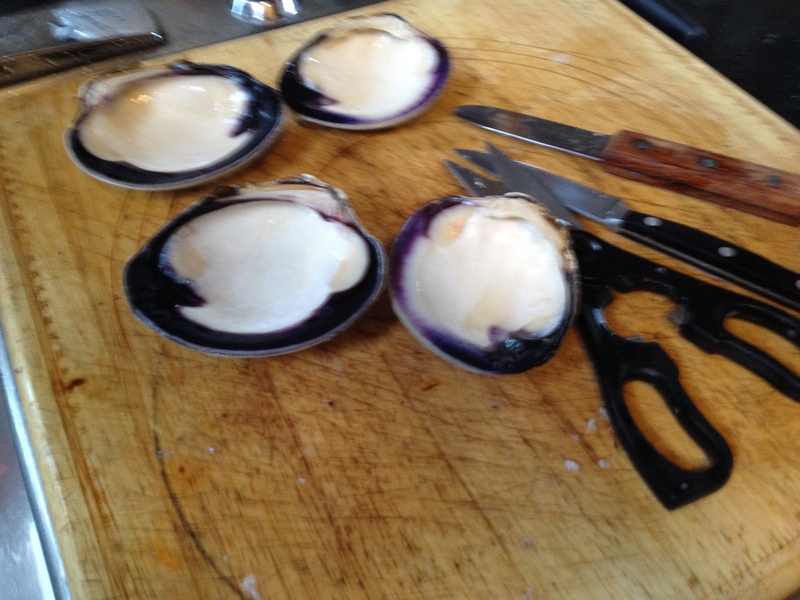 Meanwhile, scrub clams and place on a broiler sheet and broil at 450 degrees, when they start to open, pull them out, let them cool and then open them. This can be difficult because they are old and strong, slide a sharp knife inside and cut all around the meat and tendons. If this meat is not too tough, chop it up and add it to the stuffing. Scrub shells thoroughly, scraping off and cutting the membrane. and….. Aren’t they pretty? Native Americans used them for currency – Wampum. Taste the stuffing, if it needs salt, add it now. The clams and sausage are usually salty enough. 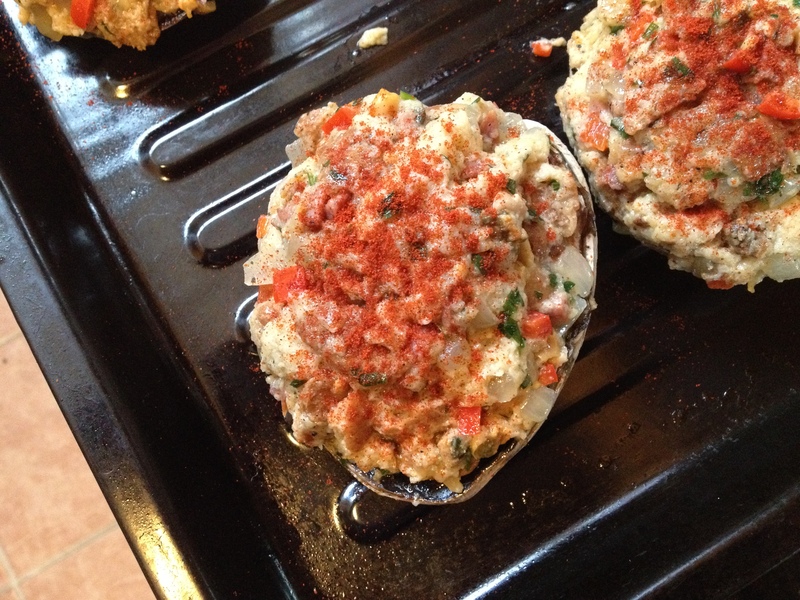 Stuff shells generously and sprinkle with a good dose of paprika. Bake in a 350 degree oven for 35-40 minutes. Let them cool slightly and eat with a good dose of your favorite hot sauce – I like Siracha! Yum! On a side note – You might want to use some aluminum foil wadded up underneath them, to make them sit evenly on the pan. I didn’t do this and some of the stuffing slid out of the shell. Hope you try this, it really is worth the extra work!